Skelmersdale Veterans Association are running a conference on the 16th February from 12.30-17.30 at Evermoor Hub and would like to invite veterans of any service including reservist and family welcome or support the event. 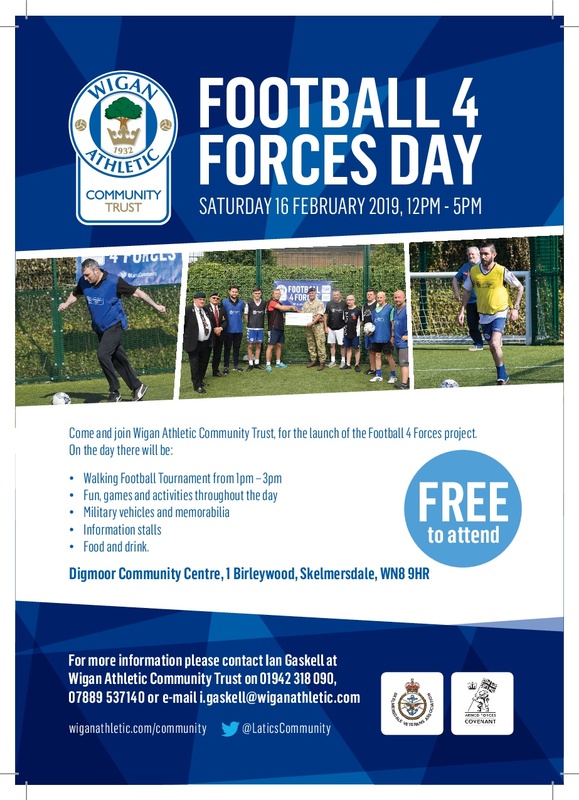 The association is working with Wigan Athletic Community Trust to run the Conference which will include the opportunity for those who attend to visit stands from ICAN, Royal British Legion, Under the Bark, Help For Hero’s, Lancashire Police, Lancashire Fire Rescue, Leyland and Chorley Veterans Café’s, Ed Centre, Dig In, and many more. You don’t need to book a place just come along and get involved. The event will be opened by West Lancashire MP Rosie Cooper and the local Mayor Cllr Noel Delaney. There will also be the opportunity to take part in a walking football tournament or find out how you and join a team. Taking part in activities like this have been found to not only improve health and wellbeing but help participants to meet and make new friends and reduce the effects of loneliness and mental health problems including PTSD. The conference will also have the TA Reservist Unit from St Helens with weapons and heavy Gun display and Under the Bark will bring a display of military memorabilia. Skelmersdale Veterans Association will continue to run monthly and weekly session walking football sessions at Evermoor Hub in Skelmersdale with the support of Ian Gaskell from Wigan Athletic Community Trust and are looking for additional sponsors for the team. ← Dinosaur egg discovered in Skelmersdale school!